Want to study a Master’s in management in Birmingham? Our MSc Management and Entrepreneurship course is accredited by the Chartered Management Institute (CMI). 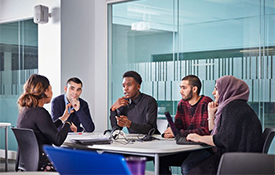 The Management and Entrepreneurship MSc is a challenging but highly rewarding pathway that will provide an innovative gateway into starting your own business, as well as helping you develop a legitimate business plan that you can use to start your company. Our Management and Entrepreneurship course teaches you the fundamental skills and attributes you need to become a successful entrepreneur. You will work in internationally diverse student teams, collaborating to deliver effective and professional reports, reflecting the professional practice of international management. Throughout the course, the course team will give you the support you need to realise your potential, and we look forward to working with you to develop your knowledge, understanding and skills for the career of your choice. At Stage One you’ll become adept at strategic and tactical business decisions, developing core skills in key areas, including finance, people management, operations and marketing. You will examine the key challenges faced by global businesses, to fully appreciate the complexity and dynamics of leadership and management practice. This will see you broaden your skills in organisation, communication and working with others, particularly within an increasingly culturally diverse business context. Stage Two develops your specialist knowledge, understanding and skills via the New Venture Creation module which specifically focuses on the applied aspects of entrepreneurial activity. In parallel, you will also learn about strategic management and develop your skills in research practice to prepare for your major project. The Stage Three module of Entrepreneurship in Practice is a lecture and seminar series of specialist topics giving real world practical insights into entrepreneurship practice. You will explore critical issues faced by entrepreneurs, such as entrepreneurship capital, buying a business, succession planning and start-up marketing. You will be given the option to develop your business concept into a substantial piece of research and business plan via the Entrepreneurship Project module. You will be able to self-appraise and reflect on your entrepreneurship skills at all three stages of the course. You will develop fundamental skills in business management, while having the opportunity to gain enhanced and specialist expertise to help you develop your own business idea as an entrepreneur. You will have the opportunity to create a truly unique business model using the latest entrepreneurial tools and techniques, while still receiving a thorough grounding in the business fundamentals of finance, marketing, operations, people management and strategy. On graduating you will receive an industry recognised professional qualification from the Chartered Management Institute (CMI). You will work alongside a diverse range of international students, giving you an opportunity to gain fresh perspectives on your business idea by your peers from a range of diverse cultures, such as Europe, Nigeria, India, China, Vietnam and North America. You will receive expert tuition and mentoring from tutors, who have a range of practical experience in starting up and developing small to medium sized businesses. T new venture creation module is intended to support you in exploring and testing a business idea. It is a practical, interactive module, focused on exploring the practicalities of starting-up a new business. Providing insight into entrepreneurship and small business start-up process, this module also highlights the significance of entrepreneurship, creativity and innovation within the new venture creation process. This module has been designed to allow you to explore entrepreneurship and how new business ventures are created and sustained. The module challenges you to think creatively and entrepreneurially in applying theories, concepts and models to the real world by developing your own business ideas and presenting them in the form of a business plan. Further study opportunities include MPhil and PhD programmes.